Sometimes you can tell a book by its cover. This cover is a signature cake: Pistachio, Cardamom and White Chocolate Cake. The choice of cover shot here could not have been easy. Open the book, flip the pages, and photo after photo stuns you. This is book of visual design for desserts, along of course with the recipes. But then, what else would you expect from someone trained as a fashion designer? Some people have life journeys that are remarkably diverse. Chetna Makan grew up in central India with a family that was not rich and did even own an oven. Her mom simply cooked everything on a stovetop, include Indian breads and other “baked” goods. Chetna went away to school, learned to be a fashion designer, traveled the world, tasted the foods, married, and settled in Great Britain. Her eye for design and her sweet tooth have led to double success. First, she was a semi-finalist on the Great British Bake Off television contest. That’s quite an achievement for someone with her quite non-British background. And the other success is this book, The Cardamom Trail. The subtitle tells you more: Chetna Bakes with the Flavors of the East. So, yes, cardamom abounds in this book, hence the cover picture cake of Pistachio, Cardamom and White Chocolate Cake. But Chetna tries to incorporate all her Indian flavors into Western style treats. So you’ll find recipes here employing saffron, star anise, fennel, clove, coriander, fenugreek, and, of course, cardamom. 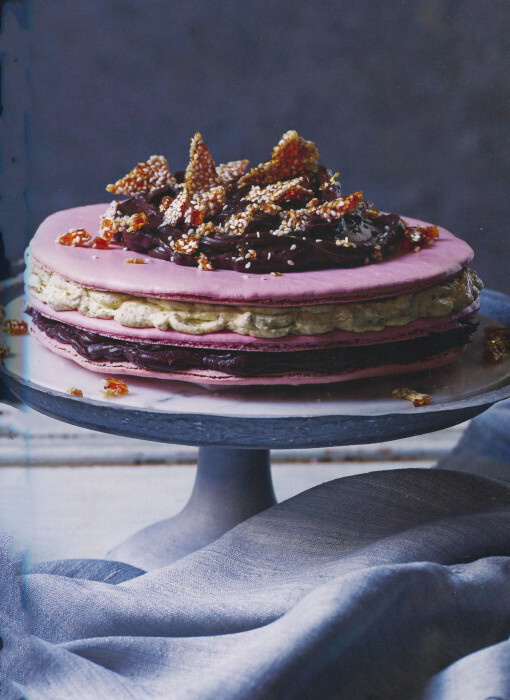 This post ends with a picture of her Sesame, Pistachio, and Rose Macaron Cake. Your only dilemma with this book is where to start. Early on, in the first two chapters, you’ll feel at home looking at the lovely baked goods with names that ring clearly. Although, there is in most of them the introduction of some Indian flavors that you might not expect. As the chapters progress, the geography and cuisine shift. Chetna offers more ideas from her native India. The title will not be familiar, the shapes will be different, but it does all seem so very appetizing. There is incredible diversity in this lovely produced book. The paper, typography and layout are inviting. The photos are spectacular. The recipes take one page each and contain a solid amount of writing. These are recipes that weave some complexity to achieve both the visual and flavor sucess you will experience. The ingredient lists are usually a dozen plus. The usual flour and sugar and eggs plus the exotic twists Chetna introduces, not with overpowering flavor but just with tints and hints to generate a grin. The spectacular visual appeal is achieved by literally dressing each final product. A frosting or whipped cream sprinkled with nuts. A syrup incorporated for flavor. No single step is hard, there is nothing that will give you pause. But you will spend some time and then unveil a dessert of substance and delight. 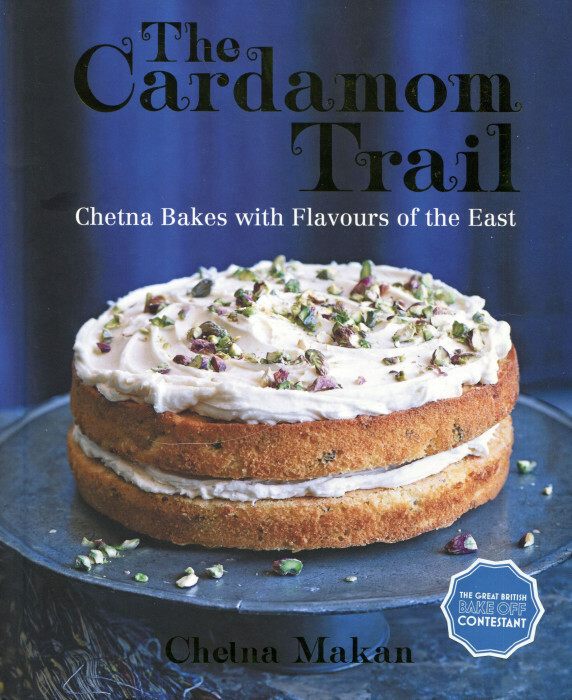 The Cardamom Trail was published last week in Great Britain and will appear in the US next week. Do find a copy and enjoy every moment as you scan through and decide what to make first. I showed The Cardamom Trail to my wife Suzi and I think this weekend we are going to double down: the dinner will feature the Curry Onion Tart while dessert has to be the Black Sesame and Lime Cake. Suzi tends to get her way the first time out of a new book. But when next I’m upstate in our test kitchen and on my own, I’m going for that Pistachio, Cardamom and White Chocolate Cake. I’ll be a good husband and save her a piece. Probably.